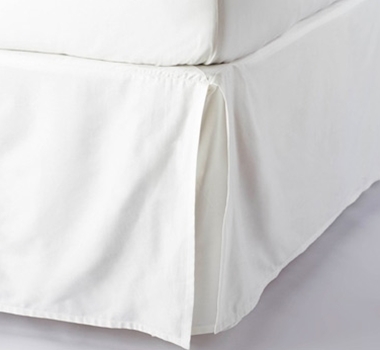 These Fair-Trade bed skirts are made from 100% Organic Cotton Sateen. This sateen skirt has a single inverted pleat on each side and split corners to accommodate bedposts neatly. It has been loomed to a 300-thread count, and has the same buttery feel and lustrous look as the sateen sheets we offer. Features a plain-weave cotton deck and a 16" drop. These cotton bed skirts are machine washable. Machine washing on the gentle or delicate cycle with warm water and non-phosphate soap is recommended. Line dry, or tumble dry low and remove promptly. Use a warm iron on cotton, or a hot iron on linen, as needed. We do not recommend using whiteners as bleaching agents may diminish the brilliance and depth of the colors; when needed, use only non-chlorine bleach. Please refer to the product tag for more specific instructions.